Introducing Hands-on Pass-around Life-size Brain Model with arteries. Replicating a real human brain with an overall dimension of 6x5x7 inches (14x13x18cm), this life-size brain model is highly educational and functional because it is can be divided into eight parts and practically shows the arterial blood supply. Its component includes the large basilar artery, the pituitary, the right hemisphere (which can be divided in two segments) and the left hemisphere (which also can be split into four sections including the half of the cerebellum and the half of the brain stem). This Hands-on Pass Around Life-size brain model is made of a non-breakable vinyl plastic material and resting into a molded display base allowing a simultaneous viewing of the brain’s superior, inferior and lateral aspects. Each part of this model is kept together with a steel pins so that it will remain intact during the pass around but still allow a quick disassembly to facilitate a hands-on study. In addition to that, this model introduces 100 hand numbered features which are identified in its accompanying key. 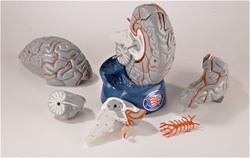 100% AMERICAN MADE- This brain model is 100% American made so we can guarantee you that every step of its production starting from model molding, hand sanding, hand painting and numbering are all carried out in the US. LIFE-TIME SATISFSCTION GUARANTEE- Each of these autographed anatomy models carried a life-time satisfaction guarantee that in case the model has been proved to have a factory defect, we can assure you that we will definitely replace or repair your model as long as you own this model. AUTHOGRAPHED ANATOMY MODELS- These are the only Autographed Anatomy Models in the world wherein each of these models are autographed and dated by its crafted. DURABLE- This Hands-on Pass Around Life-size brain model is made of a non-breakable vinyl plastic material and each part of this model is kept together with a steel pins so that it will remain intact during the pass around.